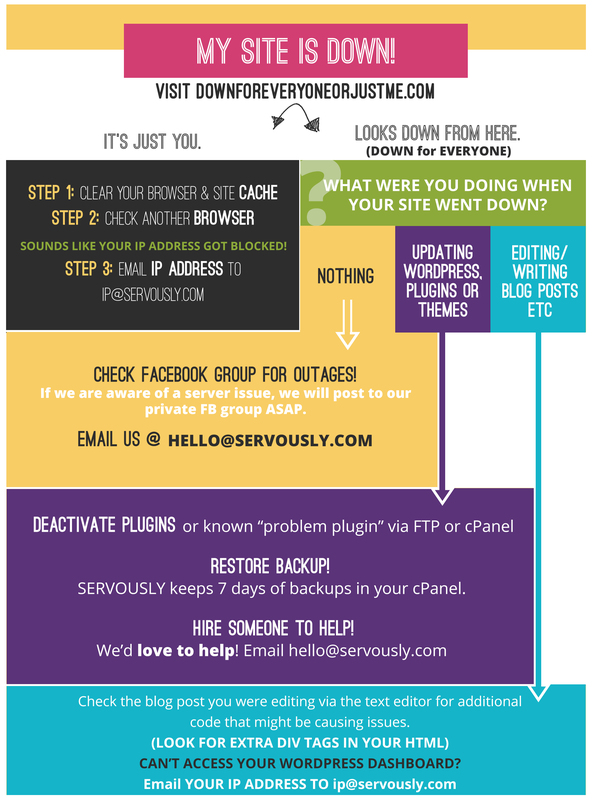 You are here: Home / My Site is Down! Here is a list of how to clear the cache in some of the most popular browsers: https://www.digitaltrends.com/computing/how-to-clear-your-browser-cache/. You can also Google search “how to clear my browser cache” and find a number of tutorials. This can vary depending on the caching plugin that you have installed. How do I restore a backup of my site? Servously provides daily backups that are saved on a remote server. We have 7 days worth of backups available in your cPanel. To restore a backup, log into your cPanel. Scroll to the section called JetBackup and click on Full Account Backups. You will find a list of available backups and an option to RESTORE. Click Restore and the process will get started. Keep in mind that any changes made (on any sites in your account) between the time of the backup and the current time will be lost. The time of the restore will vary depending on the size of your account. How do I find the Facebook Group? Need help?? We’d LOVE to help! Editing a blog post, updating plugins, updating theme, adding code, etc. There is no charge for whitelisting an IP address!